England is one of the world’s top tourist destinations, where visits to the homes of English poets, dramatists, novelists, artists, composers and scientists are firmly on the itinerary. To name just a few, around London one can see the homes of Milton, Darwin, Keats, Coleridge, Dickens, Dr Johnson and many others. A few day trips from there will take visitors to the worlds of such famous figures as Jane Austen, John Constable, William Turner, Benjamin Britten and too many more to name. Of course, many tourists coming to England have a visit to historic Stratford-upon-Avon on their itenrary, which is rich in things Shakespearean. You can see his birthplace, his school, the cottage where his wife grew up, and many other places associated with him. The one place you cannot see, though, the possession he was probably most proud of, is New House, the house he bought in 1597. By that time he had become very successful as a writer and theatre proprietor, and the house is always described as the second best house in Stratford. It became the main residence of his wife, Anne Hathaway, and the Shakespeare daughters. 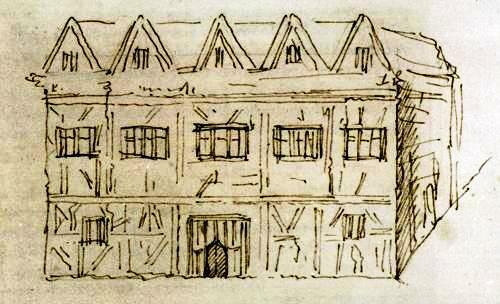 When Shakespeare retired in 1610 he moved into New House permanently and died there in 1616. Anne lived there until her death in 1623. If the house had survived it would have been one of the most important items of English cultural and historical heritage. 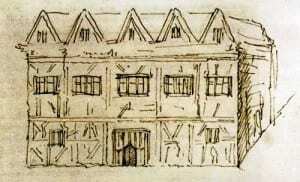 It is thought to be the place where Shakespeare wrote his last plays, including The Tempest, and where younger writers came to seek his assistance with their plays. You will be able to visit the site, but all you will see are signs of New House’s foundations: the house was demolished in 1759. How did such a tragedy occur? It’s an interesting story of spite and a tragedy of cultural attitudes towards property. This year, 2013, marks a hundred years since the first legislation was passed giving the British government power to act directly when an historic site is under threat. That Britain has very strict and powerful conservation laws will prevent such further tragedies but they came far too late to save New Place. We can only be grateful that the Birthplace is still there, and that so many such buildings survived: up until the time the new law was introduced property owners had the right to do what they liked with the buildings, gardens, fields and so on, that they owned. They could alter them or completely demolish them. The Reverend Francis Gastrell bought the house in 1753. 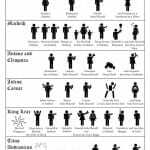 He soon made himself unpopular by chopping down a mulberry tree that the Shakespeare family had planted. So he wasn’t very happy, and he became increasingly unhappier as people were always leaning over his garden fence, staring, and knocking on his door, wanting to see inside the house. At this time, too, he was in a prolonged dispute with local officials concerning his taxes. In a fit of rage and incredible spite he had the house demolished in 1759. He never rebuilt anything on the site and it remains vacant to this day, with only traces of the foundations for tourists to view. The residents of Stratford were horrified but there was nothing they could do about it. Gastrell became impossibly unpopular and eventually moved away from Stratford. Those people who own listed buildings in Britain and complain about not being able to change as much as a doorknob should think about this little horror story and be grateful that for a hundred years no-one has been able to do anything as monstrous as the Reverend Francis Gastrell was allowed to do.